Ugh, just when we thought we were on the verge of some real progress, we got the disappointing news today that Rudy did NOT pass the sleep study! Dr. Pornchai (UCLA Pulmonologist) called this afternoon with the news. 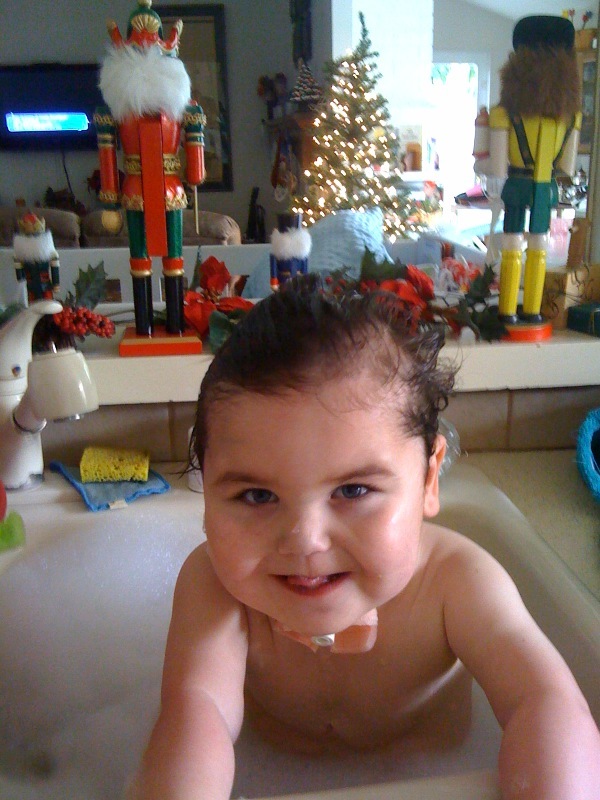 Apparently, there was no question about it…shortly after plugging the trach while sleeping, his heartrate spiked and his breathing became labored. (Where was I?) It’s clear he is still dependent on the trach and so we need to stop the decannulation process and wait to see Dr. Pornchai again at our next appointment in late January. We were pretty convinced he was ready to pull the darn thing so today’s news sure feels like a setback. What’s most depressing is the thought of having to reorder trach supplies with CrApria…I’ll have to make that call tomorrow. We have a couple of questions for Dr. Shapiro (UCLA ENT) and will try to make contact with her tomorrow as well. Now that decannulation is off the table, I guess we’ll move on to plan C (plan A being “heart surgery”, plan B being “decannulation”…) which is working on Rudy’ s food aversion and getting him to eat real food. This is a long, tedious process but the next “major milestone” we’ve been waiting to conquer. Though minor compared to heart surgery or decannulaton, the pressure is on at this point because if he doesn’t learn to eat and eventually eliminate the need for the feeding tube, I think I’ll start to pull my hair out or it may just start falling out on its own. As seems to be our MO this fall, our challenge in the coming weeks will be to stay focused and not dwell in the disappointment. We’ll keep you posted…As always, thank you for praying! Well, RATS. And double RATS. I’m sorry, Trish. And I pray for some encouraging news on some front very, very soon. Also praying for wisdom and grace as you try to introduce solid food again – oh my, it never ends, does it? I say, stamp your feet a little, yell at heaven a lot. God can handle it and you undoubtedly need a little venting space. Then, of course, you’ll get back to the good work you continually do of loving your boy (and all your family) and enjoying his sweet smiles and happy disposition (most of the time!). Many, many blessings of love to you, sweet Trish. As always, our prayers are daily with you, Rolf and the entire family, especially Rudy. Thank you for keeping us all posted as it helps us keep up with prayer needs moment to moment. Hoping that Rudy will get a “taste” for food and just a few more weeks waiting he will be ready again to get rid of the trach. Keeping you all in my prayers! I’m sorry, Trish and Rolf. One setback after another–it must be so discouraging. My whole Bible study is praying for Rudy, and I’ll ask them to keep it up. Super cute picture, by the way. I am so sorry to hear this you guys. I will be praying for Rudy this morning in my prayer time. And seeking the Lord for you~ “Those who hope in the Lord will not be disappointed.” Love you so and am standing with you in this. I’m so bummed to hear that. I’ll be praying that he makes progress on the food front. Hopefully next thing you know he’ll be saddled up next to you at In N Out eating a double-double and drinking an extra large Diet Coke. Yeah baby!!!!!! Love you all and thanks for always keeping us posted. Another dip on the Rudy-coaster! What a ride! Keep your grip on the handlebars….I know you will. You are all AMAZING! Uncle Steve’s right. Keep your grip on those handlebars. You’re not only AMAZING, you’re all INSPIRING! Love you guys… and praying. As always I lift all of you up to our loving Lord and God–master of the universe. I haven’t posted a reply in a while, but HAVE been keeping up to date and praying for you all. I will echo your friend and say, RATS!! A double rats! I am so sorry you have to hault the next step you all were so ready to conquer! I know God has a plan…I pray that he give you a heart of encouragement in the middle of all this ‘not the answer I was expecting’ kind of news. Blessings…..would really love to get together and give you a hug! Disappointed with you!!! !..May the God of Hope give you something beautiful to hold on to…love you! Geez, Rudy just doesn’t want to play the game according to our rules! But any frown turns upside down when you look at that face!